Title ทริปเปิลเอช แคคตัส แจ็ก (รีไทร์) Hartford, Connecticut 02000-02-27-กุมภาพันธ์ 27, 2000 Title vs. career match at No Way Out. Title ทริปเปิลเอช เคน (นักมวยปล้ำ) (หน้ากาก) San Antonio, Texas 02003-06-23-มิถุนายน 23, 2003 Title vs. mask match on Raw. 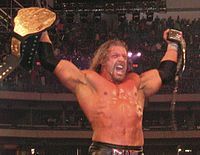 ↑ Triple H's fifth reign was as Undisputed WWF Champion. His next three were as simply WWE Champion, while his ninth reign was as WWE World Heavyweight Champion. ↑ Triple H's reign with Shawn Michaels was when the title, then known as World Tag Team Championship, was unified with the WWE Tag Team Championship and known as Unified WWE Tag Team Championship. ↑ 1.0 1.1 "HHH salary and job title". 411 Mania. สืบค้นเมื่อ 2014-03-23. ↑ 2.0 2.1 Triple H; Robert Caprio (May 11, 2010). Triple H Making the Game: Triple H's Approach to a Better Body. Simon and Schuster. ISBN 978-1-4391-2175-7. ↑ Jason Skog (2012). Triple H: At the Top of His Game. Capstone Press. p. 8 pp. ISBN 978-1429686778. ↑ 4.0 4.1 4.2 4.3 4.4 4.5 "Triple H Bio". World Wrestling Entertainment. สืบค้นเมื่อ April 14, 2009. ↑ "Triple H Bio". Online World of Wrestling. สืบค้นเมื่อ 2011-08-30. ↑ 7.0 7.1 "Raw – June 12, 2006 Results". Online World of Wrestling. สืบค้นเมื่อ July 11, 2007. ↑ "Hunter Hearst Helmsley: Triple H Now an Exec". สืบค้นเมื่อ September 14, 2014. ↑ "W.W.W.F./W.W.F./W.W.E. World Heavyweight Title". Wrestling-Titles.com. สืบค้นเมื่อ October 8, 2007. ↑ "World Heavyweight Title (W.W.E. Smackdown!)". Wrestling-Titles.com. สืบค้นเมื่อ October 8, 2007. ↑ "John Rodeo Interview". JohnRodeo.com. September 16, 2001. สืบค้นเมื่อ April 27, 2014. ↑ Marvez, Alex (April 2001). "Triple Threat". Wrestling Digest. p. 2. Archived from the original on July 20, 2010. สืบค้นเมื่อ July 17, 2008. ↑ Marvez, Alex (April 2001). "Triple Threat (p. 3)". Wrestling Digest. Archived from the original on July 18, 2010. สืบค้นเมื่อ July 17, 2008. ↑ "Wrestler snapshot: Triple H". Wrestling Digest. August 2002. Archived from the original on November 21, 2007. สืบค้นเมื่อ September 20, 2007. ↑ "Starrcade 1994 results". Pro Wrestling History. สืบค้นเมื่อ July 13, 2009. ↑ Hurley, Oliver (April 20, 2006). "Power Slam Magazine, issue 142". "WrestleMania In Person” (WrestleMania 22). SW Publishing. pp. 16–19. ↑ Sitterson, Aubrey (February 16, 2009). "Game changer". WWE. สืบค้นเมื่อ April 13, 2009. ↑ Sitterson, Aubrey (2009-03-02). "Breaking the news". World Wrestling Entertainment. สืบค้นเมื่อ April 6, 2009. ↑ Caldwell, James (December 13, 2009). "Caldwell's WWE TLC PPV Report 12/13: Complete PPV report on Cena vs. Sheamus, DX vs. JeriShow, Taker vs. Batista". PWTorch. สืบค้นเมื่อ 2009-12-14. ↑ Plummer, Dale (2010-03-01). "RAW: A bad trip on the Road to Wrestlemania". Slam! Sports. Canadian Online Explorer. สืบค้นเมื่อ 2010-03-29. ↑ Martin, Adam (2010-03-28). "Wrestlemania 26 Results – 3/28/10". WrestleView. สืบค้นเมื่อ March 29, 2010. ↑ Tello, Craig. ""Game" changer for McMahon". WWE. ↑ "John Cena vs. CM Punk – Undisputed WWE Championship Match". WWE. สืบค้นเมื่อ August 1, 2011. ↑ "Kevin Nash released". WWE.com. 2011-09-07. สืบค้นเมื่อ September 7, 2011. ↑ Tello, Craig. "WWE COO Triple H def. CM Punk (No Disqualification Match)". WWE. สืบค้นเมื่อ September 12, 2011. ↑ McMahon named John Laurinaitis Interim Raw GM "WWE Raw SuperShow results: The "Laurinaitis Era" begins" Check |url= value (help). WWE.com. สืบค้นเมื่อ October 12, 2011. ↑ "Triple H & CM Punk vs. The Miz & R-Truth". WWE. สืบค้นเมื่อ October 12, 2011. ↑ Hillhouse, Dave (December 18, 2011). "TLC: The trouble with tables". Slam! Sports. Canadian Online Explorer. สืบค้นเมื่อ December 18, 2011. ↑ Passero, Mitch (January 30, 2012). "The Undertaker returned with his sights set on Triple H". WWE. สืบค้นเมื่อ January 30, 2012. ↑ Medalis, Kara A. (February 13, 2012). "WWE Raw SuperShow results: Has Cena embraced the hate?". WWE. สืบค้นเมื่อ February 14, 2012. ↑ "The Undertaker vs. Triple H (Hell in a Cell Match with special referee Shawn Michaels)". WWE. สืบค้นเมื่อ February 20, 2012. ↑ Ryan Murphy (April 2, 2012). "End of an era". WWE. สืบค้นเมื่อ April 2, 2012. ↑ Scannell, Robin. "Raw Storyline Tracker - Complete Over the Limit build-up: Cena-Laurinaitis, Triple H-Lesnar, Punk-Bryan, Big Show "fired," more!". Pro Wrestling Torch. สืบค้นเมื่อ June 12, 2012. ↑ Caldwell, James. "Caldwell's WWE Raw Results 4/30: Ongoing "virtual-time" coverage of live Raw Starring Brock Lesnar - PPV fall-out, Triple H returns". Pro Wrestling Torch. สืบค้นเมื่อ June 12, 2012. ↑ Caldwell, James. "CALDWELL'S WWE RAW RESULTS 5/14: Ongoing "virtual-time" coverage of live Raw - Cena & Triple H return, final PPV hype". Pro Wrestling Torch. สืบค้นเมื่อ October 10, 2012. ↑ Caldwell, James (June 17, 2012). "CALDWELL'S WWE NO WAY OUT PPV REPORT 6/17". Pro Wrestling Torch. สืบค้นเมื่อ June 17, 2012. ↑ Caldwell, James. "CALDWELL'S WWE RAW RESULTS 6/18: Ongoing "virtual-time" coverage of live Raw #994 - PPV fall-out, Johnny says good-bye, Hunter-Heyman". Pro Wrestling Torch. สืบค้นเมื่อ October 10, 2012. ↑ Caldwell, James. "CALDWELL'S WWE RAW RESULTS 7/23: Complete "virtual-time" coverage of live Raw #999 - WWE recognizes 1,000 episodes, WWE Title match, Lesnar, Rock, DX, wedding". Pro Wrestling Torch. สืบค้นเมื่อ July 28, 2012. ↑ Caldwell, James. "CALDWELL'S WWE RAW RESULTS 8/13: Complete "virtual-time" coverage of live Raw - Brock-Hunter contract signing turns physical, Punk-Cena, final Summerslam hype". Pro Wrestling Torch. สืบค้นเมื่อ October 11, 2012. ↑ Bishop, Matt. "Lesnar snaps Triple H's arm at SummerSlam". SLAM! Wrestling. สืบค้นเมื่อ October 11, 2012. ↑ Martin, Adam. "WWE: Triple H suffers "broken arm" at Summerslam". Wrestleview. สืบค้นเมื่อ October 11, 2012. ↑ "CALDWELL'S WWE RAW RESULTS 3/18: Complete "virtual-time" coverage of live Raw - Hunter signs WM29 contract, IC Title match, more WM29 developments". ↑ Myers, Thomas. "Wrestlemania 29 results: Brock Lesnar pinned by Triple H after steel step Pedigree". MMAMANIA. สืบค้นเมื่อ April 8, 2013. ↑ "WWE Extreme Rules results and reactions from last night (May 19): Believe in Gold". ↑ "Raw results: Daniel Bryan wins big at the Slammys as Cena and Orton's final face-off ends in chaos - WWE.com". WWE. สืบค้นเมื่อ September 14, 2014. ↑ Clapp, John. "The Shield vs. Evolution". WWE. สืบค้นเมื่อ May 4, 2014. ↑ Tedesco, Mike. "WWE RAW Results - 10/27/14 (John Cena vs. Seth Rollins)". wrestleview.com. สืบค้นเมื่อ October 28, 2014. ↑ Tedesco, Mike. "WWE RAW Results - 11/3/14 (Randy Orton vs. Seth Rollins)". wrestleview.com. สืบค้นเมื่อ November 4, 2014. ↑ Tedesco, Mike. "WWE Smackdown Results - 11/21/14 (Survivor Series hype)". wrestleview.com. สืบค้นเมื่อ November 22, 2014. ↑ Keller, Wade. "Keller's WWE Raw report 12/29: Lesnar and Heyman show up, Ziggler vs. Rusev in a champion vs. champion match, Edge & Christian host, Bryan's big announcement". PWTorch.com. สืบค้นเมื่อ December 31, 2014. ↑ Asher, Matthew. "WWE Fastlane: Questionable match endings and fan reaction may hurt 'Mania". Canoe.ca. สืบค้นเมื่อ March 13, 2015. ↑ Powell, John. "WrestleMania 31 the best Mania ever". Canoe.ca. Slam Wrestling. สืบค้นเมื่อ 30 March 2015. ↑ "Ronda Rousey's takedown of The Authority makes headlines". WWE. สืบค้นเมื่อ July 12, 2015. ↑ Caldwell, James. "12/13 WWE TLC PPV results". PWTorch.com. สืบค้นเมื่อ December 14, 2015. ↑ "Who won the Royal Rumble?". Sky Sports. สืบค้นเมื่อ January 25, 2016. ↑ Caldwell, James. "4/3 WrestleMania 32 PPV Results – CALDWELL'S Complete Live Report on Main PPV". Pro Wrestling Torch. สืบค้นเมื่อ April 3, 2016. ↑ Keller, Wade. "KELLER'S WWE RAW REVIEW 8/29: Ongoing coverage of fatal four way for the WWE Universal Title". Pro Wrestling Torch. สืบค้นเมื่อ August 29, 2016. ↑ Hamlin, Jeff (January 23, 2017). "WWE RAW LIVE RESULTS: ROYAL RUMBLE GO-HOME SHOW". Wrestling Observer. สืบค้นเมื่อ February 6, 2017. ↑ January, Corey (January 28, 2017). "Seth Rollins Calls Out Triple H At Tonight's NXT Takeover: San Antonio". Wrestling News. สืบค้นเมื่อ February 6, 2017. ↑ Hamlin, Jeff (January 30, 2017). "WWE RAW LIVE RESULTS: ROYAL RUMBLE FALLOUT". Wrestling Observer. สืบค้นเมื่อ February 6, 2017. ↑ Currier, Joseph (February 1, 2017). "SETH ROLLINS SUFFERS AN INJURY DURING HIS BRAWL WITH SAMOA JOE ON RAW". Wrestling Observer. สืบค้นเมื่อ February 6, 2017. ↑ Benigno, Anthony. "Seth Rollins def. Triple H (Non-Sanctioned Match)". WWE. สืบค้นเมื่อ April 2, 2017. ↑ Konuwa, Alfred (November 13, 2017). "WWE Raw Results: News And Notes After Triple H's Shocking Return". ↑ Gould, Andrew. "Triple H Runs into Videoboard After WWE Survivor Series". Bleacher Report (in อังกฤษ). สืบค้นเมื่อ November 20, 2017. ↑ Johnny (November 19, 2017). "Braun Strowman really messed HHH up. #SurvivorSeries". @WWEJohnny05 (in อังกฤษ). สืบค้นเมื่อ November 20, 2017. ↑ The Futon Critic Staff (TFC) (February 3, 2005). "Triple H Brings His Game to 'The Bernie Mac Show' Friday, March 11, on Fox". The Futon Critic. สืบค้นเมื่อ June 4, 2011. ↑ "Paul Levesque". IMDb. สืบค้นเมื่อ September 8, 2011. ↑ 79.0 79.1 79.2 79.3 79.4 79.5 79.6 79.7 79.8 79.9 "PWI Awards". Pro Wrestling Illustrated. Kappa Publishing Group. Archived from the original on January 21, 2016. สืบค้นเมื่อ March 6, 2018. ↑ "Pro Wrestling Illustrated Award Winners Match of the Year". Wrestling Information Archive. Archived from the original on June 16, 2008. สืบค้นเมื่อ June 28, 2008. ↑ "Pro Wrestling Illustrated (PWI) 500 for 2000". Internet Wrestling Database. สืบค้นเมื่อ March 6, 2018. ↑ Eck, Kevin (August 2009). "The PWI 500". The Baltimore Sun. สืบค้นเมื่อ September 4, 2009. ↑ "Title History: WWE Championship". WWE. สืบค้นเมื่อ October 14, 2007. ↑ "Title History: World Heavyweight Championship". WWE. สืบค้นเมื่อ October 14, 2007. ↑ "Title History: Intercontinental". WWE. สืบค้นเมื่อ October 14, 2007. ↑ "Title History: European". WWE. สืบค้นเมื่อ October 14, 2007. ↑ "Title History: WWE Tag Team: D-Generation X". WWE. Archived from the original on December 17, 2009. สืบค้นเมื่อ December 14, 2007. ↑ "Title History: World Tag Team: Stone Cold & Triple H". WWE. Archived from the original on October 11, 2007. สืบค้นเมื่อ October 14, 2007. ↑ "Title History: World Tag Team: D-Generation X". WWE. Archived from the original on December 17, 2009. สืบค้นเมื่อ December 14, 2007. ↑ "2011 Slammy Award winners". WWE. สืบค้นเมื่อ March 6, 2018. ↑ "2012 WWE Slammy Awards and WWE.com Slammy Awards winners". WWE. สืบค้นเมื่อ March 6, 2018. ↑ Meltzer, Dave (January 25, 2016). "January 25, 2016 Wrestling Observer Newsletter: 2015 Observer Awards Issue". Wrestling Observer Newsletter. Campbell, California. p. 45. ISSN 1083-9593. ↑ 95.0 95.1 95.2 95.3 95.4 95.5 95.6 95.7 95.8 95.9 Meltzer, Dave (January 26, 2011). "Biggest issue of the year: The 2011 Wrestling Observer Newsletter Awards Issue". Wrestling Observer Newsletter. Campbell, CA. pp. 1–40. ISSN 1083-9593. ↑ Meltzer, Dave (January 30, 2012). "Jan 30 Wrestling Observer Newsletter: Gigantic year-end awards issue, best and worst in all categories plus UFC on FX 1, death of Savannah Jack, ratings, tons and tons of news". Wrestling Observer Newsletter. Campbell, CA. ISSN 1083-9593. ↑ WWE [WWE] (May 10, 2017). "BREAKING: @TripleH is set to be inducted into the @BGCA_Clubs Alumni Hall of Fame! More details:…" (ทวีต) – โดยทาง ทวิตเตอร์. ↑ "TRIPLE H HEADED INTO THE HALL OF FAME - PWInsider.com". หน้านี้แก้ไขล่าสุดเมื่อวันที่ 27 กุมภาพันธ์ 2562 เวลา 23:06 น.